As I write this, I’m on a train somewhere between Peterborough and Norwich. It’s just after 8am and I’ve been awake since 5am; please excuse any of the following: hyperbole, waxing lyrical, over enthusiasm and any other nonsense. Pineapple chilli jam is not, as you can imagine, for spreading on toast or bread and the description of jam is more for the consistency rather than the condiment itself. It is more of a chutney than a jam, for smearing on cheese and crackers, preferably a very mature cheddar and some good salted butter. First introduced to me by our friend Sarah at one of the annual Christmas get together, I’ve been wanting to try making it for several years but as always, lack of confidence getting the better of me. I know cheese and pineapple are a match that some may find a bit naff and dated. Reminiscent of children’s birthday parties and buffets, the cocktail sticks sticking out of a halved melon making a “hedgehog” and making your hands sticky as the chunk of pineapple slips off its stick may bring back memories of parties you’d rather forget. I won’t even go into the minefield that covers the merits or protestation over pineapple on pizza. The pairing of sweet, golden yellow fruit with the saltiness of cheddar cheese will always be a favourite of mine and so, this is perfect friend for cheese. Pineapples were on offer at Aldi this week, and a medium sized fruit was 88p. The time had come to take up the opportunity. This recipe made one small jar (an old mustard jar) plus a spoonful that wouldn’t fit, so we ate it. Peel, core and chop the pineapple into small pieces. You want some chunkier bits and some smaller pieces…however, textures are personal. Finely chop the chillis including the seeds and finely chop the garlic. 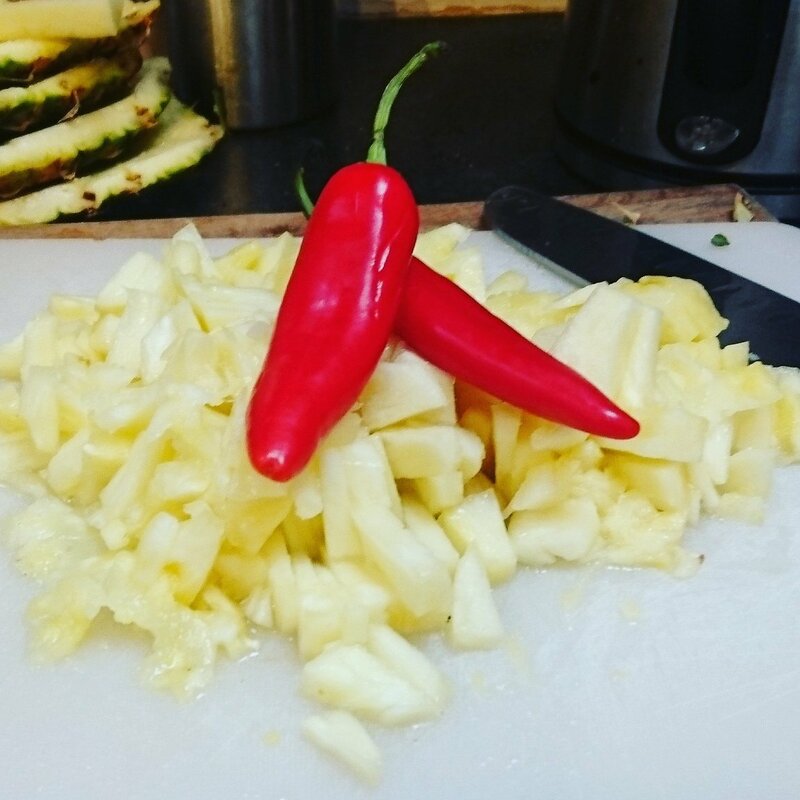 Add pineapple, chilli, garlic and both sugars to a heavy bottomed pan and bring to the boil, stirring regularly. Reduce the heat and allow to soften and reduce until the sugars have caramelised (but don’t allow to burn) and the fruit is soft and very sticky. Allow to cool until barely lukewarm and stuff into a sterilised jar. Add a circle of greaseproof paper or waxed disc to the top of the jam and seal. Keep in the cupboard or fridge and use over the festive period. It’s not overly spicy, more a gentle tang and warming taste. You could use much hotter chillis and have a proper sweat inducing accompaniment if that’s your thing.